I have researched, written, edited and produced numerous reports, with many in recent years focused on demographics. The small report printed below was used in a June 2015 presentation before SPI, the Society of the Plastics Industry. How big and how much is he going to grow? Despite the likely manipulation of economic numbers, few people will dispute that China’s economy, like its population, is massive. The question is, how big and how much is it going to grow? It’s like trying to calculate the size of a giant by looking at his grainy photographic portrait, and then trying to figure out potential growth by rummaging through his compost bin to determine how much he consumes. But, no matter what the answer is, a giant is still a giant, and the Chinese middle class has quickly grown into one such giant. Again the question is, how big and how much is it going to grow? To start with we need to determine what constitutes “middle class,” an ambiguous term that can easily be misapplied if its parameters aren’t delineated. Broadly speaking, middle class is the group of people in a society who reside socio-economically between the working class and upper class. In describing the North American middle class social scientists generally apply social aspects–such as educational attainment and type of employment–to the equation. On a strictly monetary basis, social scientists and economists trying to constitute what determines middle class in North America have come up with annual income ranges from $35,000 on up to $150,000. There is no hard-set definition of what constitutes “middle class” in China, but Helen H. Wang, author of the award-winning book–The Chinese Dream: The Rise of the World’s Largest Middle Class and What it Means for You–defines Chinese middle class as households with a “third of its income available for discretionary spending.” Monetarily, a middle class household would earn somewhere between $10,000 and $60,000 per year, says Ms. Wang. Global consultant McKinsey & Company, which conducts extensive studies on China’s middle class, believes $9,000 to $34,000 per year constitutes Chinese middle class earnings. Where one lives in China can also dictate middle class standards, as the spending power of the yuan varies widely between regions and between the countryside and urban areas. Thus, someone living in Shanghai needs to earn several thousand dollars more per year to be considered middle class than someone living in a rural village in Qinghai province. Annual income rates have grown phenomenally in China over the past three decades, with a 10-fold jump between 1980 to 2010. According to an analysis of official government statistics by the China Market Research Group, the average annual disposable income per capita rose from $280 in 1980 to $3,000 in 2010, which put the typical Chinese household at earning about $9,000 per year as of 2010. As of January 2014, the National Bureau of Statistics of China reported the average annual disposable income per capita at about $4,720, a 57 percent increase from 2010. The World Bank reports that China’s gross national income per capita quadrupled from 2000 to 2013, rising from $2,830 to $11,850. So, how many Chinese are middle class, and how many will be middle class in the years to come? Ms. Wang put the number at “more than 300-million” and at “more than the entire population of the United States,” and believes this population will reach 700- to 800-million by 2022. These indefinite figures have been bandied about by numerous other sources over the past three years, likely due in large part to the extensive media coverage Ms. Wang has received since the release of her book. While not putting a specific number on today’s Chinese middle class, and, like Ms. Wang in referring to it as larger than the total U.S. population, McKinley & Company believes that China’s middle class will number 630 million by 2022. This equates to roughly 75 percent of the urban population and 45 percent of the country’s entire population. In its report–China’s Emerging Middle Class: Beyond Economic Transformation–Brookings reported that China’s middle class represented roughly 12 percent of the total population as of 2009, but that China’s middle class was on the cusp of expanding exponentially due to China’s rapid growth rate and because a significant proportion of the population was “close to the lower- bound threshold of [Brookings’] definition of the middle class.” Given this assessment, Brookings believes China’s middle class will consist of about 42 percent of the population by 2020, and over 70 percent of the population by 2030. Using these percentages with Chinese population projections puts the number of middle class in China at roughly 575-million by 2020, and more than 960-million by 2030. Ernst & Young Global Limited’s Middle Class Growth in Emerging Markets report has projections similar to Brookings, placing China’s middle class as of 2010 at about 150-million, with this number rising to almost 500-million by 2020, and almost reaching 1-billion by 2030. All of these projections about the size of China’s middle class are “giant-like,” to say the least. But will these projections be reached? An observation shared by McKinsey & Company, which considers the younger generation born between 1990 and 2010 to be the most westernized to date. The company expects that this generation–three times larger than the U.S. Baby Boomers who drove U.S. consumption for years–will double their share of consumer demand within 10 years. Such observations are supported by recent data, such as U.S. exports to China growing from $27-billion in 2003 to $124-billion in 2014, or the fact General Motors sells more cars and trucks in China than in the U.S., whereas just 11 years ago the ratio was one vehicle for every 10 sold in the U.S.
Another factor to consider about the Chinese middle class is that it may be bigger than pundits think, and wealthier. As with their government, Chinese people are known to be “watery” when reporting financial numbers. Undeclared wealth is called “gray money” in China and it represents the proceeds from corruption (considered by some as rampant in China), income earned from “gray” areas of the economy, and unreported income such as year-end bonuses that most Chinese do not report. A 2012 survey by the China Society of Economic Reform concluded that gray income accounts for $1 trillion per year, or 12 percent of China’s economy. But what of the elephant in the Chinese living room (pardon the pun) that no one seems to notice. That being the lop-sided demographics of the country that make it the fastest aging country in the world by median age, and estimated to become among the oldest by median age within 20 years. China’s economic success has been largely driven by its vast pool of labor, but the water in that pool reached its peak and is now starting to slowly but steadily evaporate. According to China’s National Bureau of Statistics, the country’s potential labor force shrunk for the first time in modern history in 2012, an emerging trend that is expected to continue for at least the next 20 years due to the country’s “one-child” population control strategy. That one-child policy, according to Chinese government statistics, has kept the country’s population in check by a factor of 400-million people. And while that had served as an economic accelerant of sorts because those additional people did not need to be fed, clothed, educated or housed, it also means that many fewer consumers, wage earners and taxpayers to help continue driving the country’s economy. China’s lop-sided demographics suggest that the coming years will bring a dramatic decline in the cheap labor market that has served as the primary driver of the Chinese economy. At the same time China will see a dramatic increase in its elderly population, which earns little, spends little and pays little in taxes, yet will need much in the way of government services and health care. It remains unclear how much this elephant in the living room is going to impact the economy and how much it may slow the expansion of the middle class. But it’s an elephant. It may be sleeping now, but when it wakes up people are going to notice. Wang, Helen H. The Chinese Dream: The Rise of the World’s Largest Middle Class and What It Means to You. Bestseller Press, 2010, 2012. Kharas, Homi, and Geoffrey Gertz. 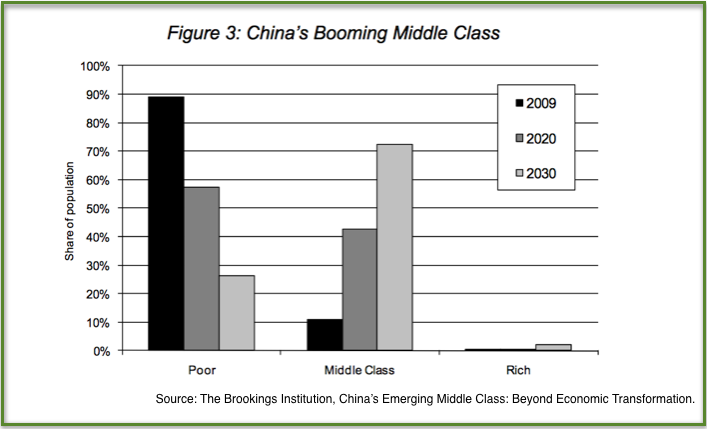 China’s Emerging Middle Class; Beyond Economic Transformation. Brookings Institution Press, 2010. Barton, Dominic, Yougang Chen, and Amy Jin. Mapping China’s Middle Class. Insights & Publications. McKinsy.com. June 2013. Chen, Lu. Why Chinese Economic Data Can’t be Trusted. China Business & Economy. TheEpochTimes.com. March 2015. Kuhn, Anthony. Lure of China’s Gray Economy Reaches Rich and Poor. National Public Radio. NPR.org. January 2014. The World Bank. World DataBank: World Development indicators. databank.worldbank.org. 2015. China Profile. Median Age of the Population in China, India, Europe and the United States of America, 1950-2100. China-Profile.com. June, 2011.